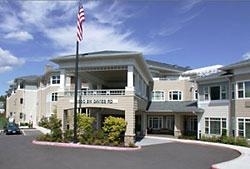 Hearthstone Senior Retirement Home - A Beaverton Oregon retirement community Where People Come First At Hearthstone we value your uniqueness and respect your personal choices. We encourage strong relationships and support intellectual and spiritual growth. We promote maximum physical health and offer an effective wellness program. Hearthstone counselors and staff work with you to keep your life meaningful and enriched. We encourage you to invite your loved ones to join you for celebrations in one of Hearthstone's gracious private dining rooms. For larger events we will be entertaining in our auditorium where you may choose your own entertainment from our full calendar of activities. Entertainment will include visits from bands, choirs and other performers. Or, you may choose to join a bus tour to Mt. Hood, the Oregon Coast or the Washington County Vineyards. And of course, you may always enjoy quiet times, relaxing in front of our cozy fireplaces or peaceful courtyards. Scheduled transportation is available for the convenience of residents.